Tournament director Trip Weldon helps Pipkens show off his fish due to his collar bone break and limited mobility. Post collar bone surgery with 7 screws and a plate. 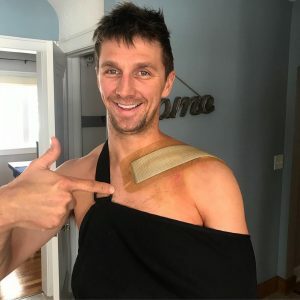 The doctor was hopeful for Pipkens, but recommended to rest, eat healthy, ice, and to do specific exercises on a daily basis and it could be possible to get on the water in four weeks. So he made sure to do just that! Pipkens was determined to fish. He knew that even catching one fish would earn him crucial angler of the year points that he would not be receiving if he did not attempt to fish. Little did he know that fishing at Lake Hartwell was going to turn out in his favor. With a few adjustments on his fishing techniques and fish landing routine, Pipkens not only figured out how to fish with his new collar bone, but he was figuring out what the fish wanted. He was in 15th place after two days of fishing, so he qualified to fish on Saturday along with the 34 other anglers. This was exceptional news, considering he was lucky to be fishing in this tournament at all. Pipkens even gained the nickname the “one armed bandit,” during this event since he still did not have full mobility of his left arm. Saturday’s fishing continued in the right direction and he ended up in 9th place. Top 10 fish on “championship” Sunday, so Pipkens made the cut yet again, and would now have a camera man in his boat as well. Pipkens was featured on BASS LIVE, especially in the morning on Sunday when he found, as he called it, a “party bed” where he caught three fish on the same bed. Unfortunately the afternoon slowed down for Pipkens and although he caught plenty of fish, he was unable to cull any fish he caught in the morning. 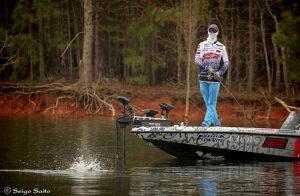 Pipkens finished the tournament on Hartwell in 9th place and moved up from 59th to 36th in the angler of the year standings. As unfortunate of an event his collar bone break was, it happened to be at the best time possible during the season if it were to happen. 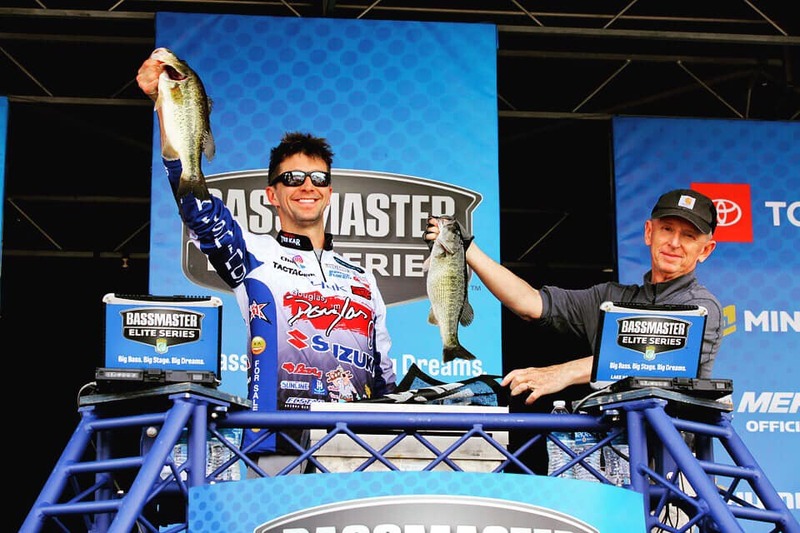 The four weeks in between tournaments from March to April were important to his recovery, and now he’s hoping to continue this good luck streak at the back-to-back tournament at Winyah Bay. Sometimes it takes a little rain to make a rainbow! Pipkens Bags First Top Ten Elite Series Finish! Enter your email address below to receive updates each time Chad publishes new content. © 2019 Chad Pipkens Elite Series Angler. All rights reserved. Powered by AnglerHosting.com.